Milford Township works closely with its neighboring municipalities to ensure joint standards and goals are defined and respected. The Quakertown Community Planning Committee is the vehicle for this planning and works together with the Bucks County Planning Commission in order to focus our capital project planning. Residential development includes Valley View, Spinnerstown Crossing, Miller’s Run, Parkside (Allentown and Kumry Roads), Streamview (Allentown Rd) and Blackledge (Portzer). Plans have previously been approved for Brookfield (Pumping Station Road) for 106 dwellings. Milford Pointe (Milford Square Pike and Rosenberger Rd) construction is completed and is now known as The Crossings of Bucks County, containing single family homes. Other plans are at various stages in the review process with activity being very slow. To track development activity, review updates to the planning agenda (PDF). 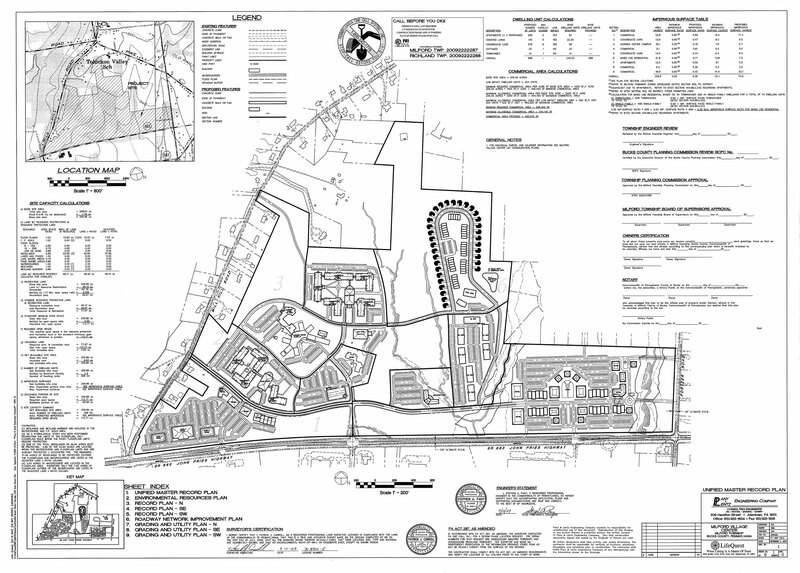 The Unified Master Plan for Milford Village, (image of map) mixed-use development area around the Upper Bucks Nursing Home, received Conditional Use approval (PDF) and each phase will require both land development and conditional use approvals. The construction of the Progress Drive access to the turnpike and the widening of Rt. 663 was the first stage of the overall plan. Other elements include the extension of Progress Drive from Weiss Road to a signalized intersection with Rosenberger Road at Rt. 663. Plans have been developed and permitting is complete for a parallel road on the southside of Rt. 663 behind the Hampton Inn. This “New” Road will connect Quaker Pointe Drive to the Turnpike and construction has begun. Plans to connect the end of Milford Square Pike to Quaker Pointe Drive have been accomplished. While the concepts are good, their implementation is difficult. These roads are being built by developers to accommodate their impact. But not all development interests have been cooperative. Some try to have the taxpayers or other developers pay for improvements. And the timing of private intensions can make coordination of the construction of a road over numerous properties difficult. Also problematic is the severe shortage of state capital improvement funding in the Quakertown Area and the uncertain progress in moving capital projects. We are working with our legislators and PennDOT Project Managers to further progress on the Portzer Road Connector and Rt. 663 bridge replacements at Allentown Road but fear these important improvements will be lost to “right-sizing”.